A couple of key terms worth noting: property, hazardous substances, and when transported in commerce. We’ll come back to those later. Now let's look at the international definitions of dangerous goods. For international transportation by air, we have the definition provided by the International Civil Aviation Organization's (ICAO) Technical Instructions for the Safe Transportation of Dangerous Goods by Air and the UN model regulations: "Dangerous goods are articles or substances which are capable of posing a risk to health, safety, property or the environment." For the international transportation by vessel, the International Maritime Organization's (IMO) regulatory definition found in the IMDG Code (International Maritime Dangerous Goods Code) is: "Dangerous goods mean the substances, materials and articles covered by the IMDG Code." to complete your IATA and IMO forms. 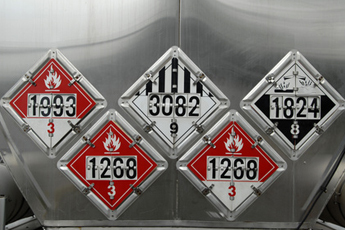 Now, for the average shipper, both hazardous materials (hazmat) and dangerous goods (DGs) terms are fairly interchangeable. However, as we saw with the definition of a hazardous material, the legality of the regulatory wording in the U.S. is very specific when it comes to property and being transported in commerce. We also see the exclusion of the term "environment" in the U.S. Department of Transportation (DOT) definition. The DOT's jurisdiction over dangerous goods overlaps with the Environmental Protection Agency's (EPA) jurisdiction. The term "hazardous substances" is an EPA term, and these substances are only regulated for transport if they are shipped in packages that exceed the reportable quantities listed in Appendix A to the table of hazardous materials found in §172.101. Under 40 CFR 302.6, the EPA requires persons in charge of facilities (including transport vehicles, vessels and aircraft) to report any release of a hazardous substance to the DOT's National Response Center if the quantity is equal to or greater than its reportable quantity. They must do so as soon as they have knowledge of the release. "Property" is another important term especially pertaining to the ownership and possible responsibility involving a hazmat incident. I'm sure corporate lawyers can provide a much clearer explanation of this, but it involves not only the goods being shipped as property, but could also involve where the goods are actually located at any point during transit. Imagine a consignment of dangerous goods arriving in the U.S. and a serious incident occurs before the importer actually receives the goods. Was there damage to someone's property such as a building or the actual transport unit container or trailer? Who is responsible? The shipper? The carrier or the owner of the goods? Remember the initial purpose of the hazmat transportation act was all about safety. This is where the regulatory requirements of a shipper relating to the use of hazardous materials terminology such as the correct UN identification numbers, proper shipping names, classification, 24-hour emergency response telephone, and other information are used. The shipping papers are also where ownership is controlled and serves as the contract of carriage in business, and it is where an understanding of the correct Incoterms 2010 is vital. The last term we need to clarify is the use of "when transported in commerce." What happens when you purchase some solvent or oil-based paint at the hardware store? Do you need labels, placards or shipping papers? No. This is where the manufacturer would need to ensure compliance with the Federal Trade Commission and the Consumer Product Safety Commission and the applicable regulatory references in CFR Title 16 — Commercial Practices in place to protect the end user. We've all seen the scary warning labels for proper storage, usage and disposal of the chemicals we keep under the sink. A general awareness of the hazard communication system. Safety and how to properly handle the hazardous materials and the need to provide emergency response information. OSHA training can be used to fulfill this if applicable. Security awareness and how to develop and maintain a possible security plan, if necessary. Function-specific training as it applies to their particular products and modes of transport both domestically and possibly internationally. The alternative use of dangerous goods training can be substituted. For air transport that means training on the ICAO/IATA regulatory requirements; for vessel shipments, that means training according to the IMDG Code. Compliance with our domestic federal law is mandatory, even for foreign shippers. Although international law is recognized, each country or state may have variations that the shipper must comply with. Guess which country has the most variations? Yup, the U.S. In CFR49 §171.22 it clearly states, "This subpart authorizes, with certain conditions and limitations, the offering for transportation and the transportation in commerce of hazardous materials in accordance with ... ICAO, IMDG Code, TDG." Note the wording, "with certain conditions and limitations." In other words, when shipping internationally to, through or from the U.S., a shipper must still comply with the domestic hazmat regulations of CFR49. So while hazardous materials and dangerous goods are somewhat similar, they are also very different depending on what is shipped, from where they originated, and where they are going. CARGOpak Corp. offers on-site training classes in a variety of formats depending on specific shippers needs for CFR49, ICAO/IATA, TDG and IMDG. Go to the CARGOpak website for more information.